Chinese online broadcasting platforms are facing increasingly fierce competition, with some courting Olympic athletes and entertainment superstars for their shows to publicize themselves, while analysts say online e-sports broadcasting and industry broadcasting are more likely to win in the long run. The fast growth in online broadcasting in China is on display at the 2016 Olympic Games in Rio de Janeiro, from the number of broadcasting platforms covering the event to their investments in sending staff to Brazil to the courting of current and former athletes for online shows. In conversations with journalists and online broadcasters from China, the Global Times has learned that all the major online broadcasting platforms including Huajiao, Ingkee and Yizhibo, are in Rio to cover the Games. "Online broadcasting platforms bring in popular Olympic athletes and entertainment stars to attract their users and win investments," Liu Dingding, a Beijing-based independent industry analyst, told the Global Times on Monday. Early in June, the famous Chinese pianist Lang Lang made an online show on Yizhibo that lasted less than two minutes, but attracted 211,000 online viewers during the broadcast. 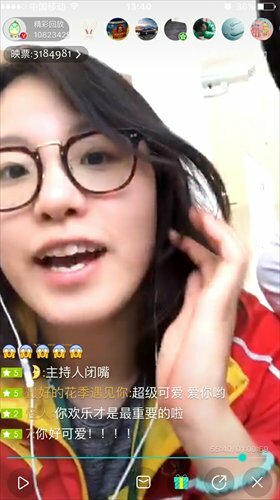 On August 10, Ingkee courted Chinese female swimmer Fu Yuanhui for online shows on its platform, following a post-competition interview with her that went viral on the Internet. Her hour-long show on the platform drew more than 11 million fans. Huajiao, in collaboration with the media company, Yanshu, has sent two journalists to Rio for the Games and has signed contracts with half a dozen former Olympians, including gold medalist diver Li Na and swimmer Zhou Yafei, to do online shows. The Global Times has discovered that current or former athletes are well paid for doing the online shows. Some athletes are paid over 15,000 yuan ($2,260) for a one-hour program, in which they talk about anything from the 2016 Games to the host city. "To further publicize themselves, these platforms seek wide cooperation," Lu Zhenwang, founder of Shanghai Wanqing Commerce Consulting, told the Global Times on Monday. Ingkee cooperated with Baidu Inc to promote its shows on the search engine, according to Baidu. "Audiences can directly watch online broadcasting shows on Sina Weibo because we have formed a cooperation with Sina," a staff member of Yizhibo told the Global Times on Monday. Although superstars and advertisements are a big investment for online broadcasting platforms, they stand to make a lot in profits. A source familiar with the online broadcasting business model told the Global Times that the majority of profits come from the money the audience send to the star of the show, or wanghong. "That's a lot of money, a popular wanghong can get a lot in tips from the audience," the source said, who declined to be named, citing agreements with the online platforms. "About 70 percent of the broadcasting revenue goes to the platform and the rest to the online broadcasters," according to the Yizhibo employee. An employee at Ingkee told the Global Times on Monday that nearly 70 percent of the profits at Ingkee go to the platform. In addition to receiving a share of the gratuities sent to wanghong, online platforms also profit from advertisements on their website or in their online programs, just like a regular broadcasting network. In 2016, many Internet startups chose to create online broadcasting platforms, the industry analyst Liu said, noting that one to three platforms emerge every day. The number of online broadcasting users reached 325 million as of June 2016, accounting for 45.8 percent of all Chinese netizens, according to data from the China Internet Network Information Center in August. Liu predicts that most small platforms will die off but that mobile e-sports platforms are promising because people who like online broadcasting shows also love computer games. The online e-sports broadcasting platform egame.qq.com, from Chinese Internet giant Tencent, was rolled out on July 27, domestic news portal people.com.cn reported the same day. Lu suggested that the online broadcasting industry would see further segmentation, like e-sports, talent shows and e-commerce broadcasting. However, Liu predicts that online platforms which integrate broadcasting with specific industries, rather than just entertainment, will be the ones to survive in the long run.